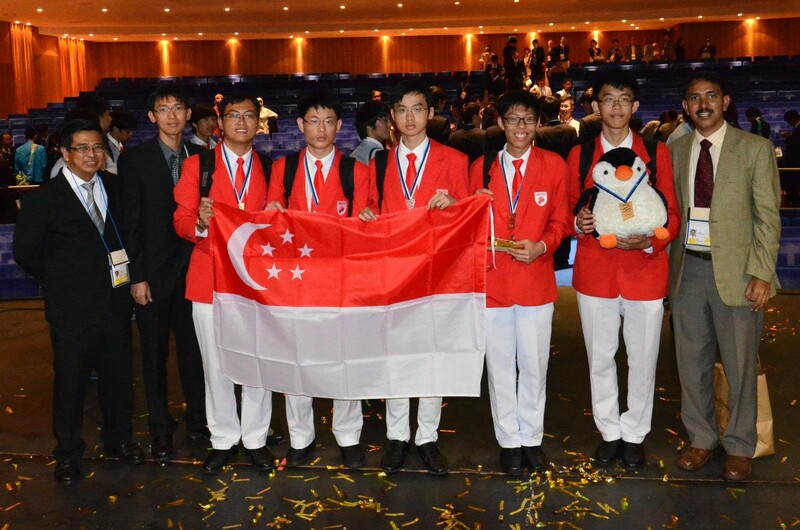 Historical results of the Singapore team can be found at the Unofficial IPhO website. Singapore has participated in this competition since 1989, and hosted the IPhO in 2006. The Singapore team obtained five Gold medals at the 48th IPhO held in Yogyakarta, Indonesia, from 16 to 24 July 2017. Singapore was placed 1st from 84 countries. The Gold medallists are Bradley Teo Wei Jie, Ma Zhao Yu, Lee Vint Ve Shein Lin Htut from Raffles Institution (Junior College)and Darren Wayne Lim, Ong Hong Ming Teddy (from NUS High School of Mathematics and Science). Singapore Team at IPhO 2017. The Singapore delegation was led by Associate Professor Rajdeep Singh Rawat from the National Institute of Education, Nanyang Technological University, Ms Fabiola Lip Soong from Anglo-Chinese Junior College, Mr Bernard Ricardo Widjaja & Ms Yenny Wijaya from NUS High School of Mathematics and Science, and Ms Yarong Yang from the Ministry of Education. The Singapore team obtained two Gold medals and three Silver medals at the 47th IPhO held in Zürich, Switzerland (and jointly hosted by Liechtenstein), from 11 to 17 July 2016. Singapore was placed 7th in a field of 400 student participants from 84 countries. The Gold medallists are Lee Yuan and Feng Jiahai from Raffles Institution (Junior College). The Silver medallists are Koh Jin Ming and Ng Jian Rong from NUS High School of Mathematics and Science and Lee Yu Tse from Raffles Institution (Junior College). Singapore Team at IPhO 2016. The Singapore delegation was led by Associate Professor Rajdeep Singh Rawat from the National Institute of Education, Nanyang Technological University, Dr Lim Zhi Han from the National University of Singapore, Ms Sandar Felicity Lim from National Junior College, Mr Wong Chu Lin from Raffles Institution and Dr Zhiming Darren Tan from the Ministry of Education. 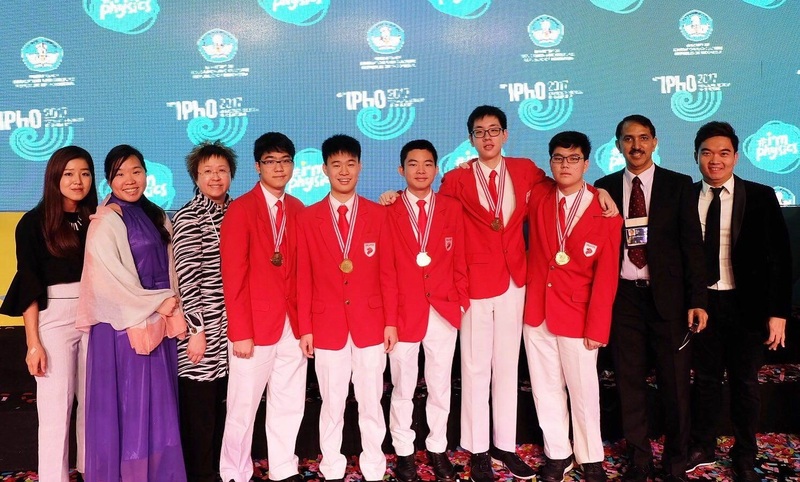 The Singapore team obtained one Gold medal and four Silver medals at the 46th IPhO held in Mumbai, India, from 5 to 12 July 2015. Singapore was placed 10th in a field of 382 student participants from 83 countries. The Gold medallist is Chua Yee Shuen Darren from Raffles Institution (Junior College). The Silver medallists are Garett Tok Ern Liang, Joel Tan Shi Quan and Joshua Lim Yong Kiat from NUS High School of Mathematics and Science and Peter Yuen Ho Hin from Raffles Institution (Junior College). Singapore Team at IPhO 2015. The Singapore delegation was led by Associate Professor Rajdeep Singh Rawat from the National Institute of Education, Nanyang Technological University, Dr Nidhi Sharma from Department of Physics, National University of Singapore, Mr Leong Tze Kwang from the Ministry of Education and Mrs Fabiola Soong-Lip Yoke Suet from Anglo-Chinese Junior College. The Singapore team obtained three Gold medals, two Silver medals and the ‘Best in Experiment’ Award at the 45th IPhO held in Astana, Kazakhstan, from 13 to 21 July 2014. Singapore was placed 5th in a field of 374 student participants from 85 countries. The Gold medallists are Wang Fan, Francis from NUS High School of Mathematics and Science, Chan Jau Tung and Lim Yong Hui from Raffles Institution (Junior College). The Silver medallists are Gideon Lee from NUS High School of Mathematics and Science and Jee Kai Yen from Raffles Institution (Junior College). The ‘Best in Experiment’ award winner is Wang Fan, Francis from NUS High School of Mathematics and Science. Singapore Team at IPhO 2014. The Singapore delegation was led by Associate Professor Rajdeep Singh Rawat and Associate Professor Lee Choon Keat, Paul from the National Institute of Education, Nanyang Technological University (NTU), and Mr Wong Chu Lin from Raffles Institution (Junior College). 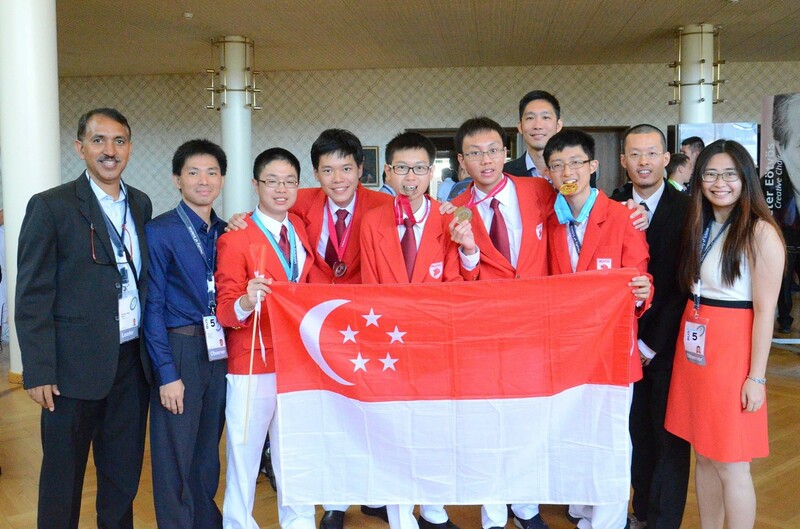 The Singapore team obtained four Gold medals and one Silver medal at the 44th IPhO held in Copenhagen, Denmark from 7 to 15 July 2013. Singapore was placed 3rd in a field of 381 student participants from 83 countries. The Gold medallists are Daniel Mark Keat Kay of Raffles Institution (Junior College) and Lim Jeck, Sean Seet Xiang En and Tan Wei Liang Byorn of NUS High School of Mathematics and Science. The Silver medallist is Ashwin Venkidachalam from Raffles Institution (Junior College). Singapore Team at IPhO 2013. The Singapore delegation was led by Associate Professor Rajdeep Singh Rawat from the National Institute of Education, Nanyang Technological University, Mr Lim Kim Yong and Miss Tao Ye from the National University of Singapore, Mr Kwek Wei Hong from Hwa Chong Institution (Junior College), and Mr Lim Yeow Heng from NUS High School of Mathematics and Science. The Singapore team obtained four Gold medals and one Silver medal at the 43rd IPhO held in Tallinn, Estonia, from 15 to 24 July 2012. 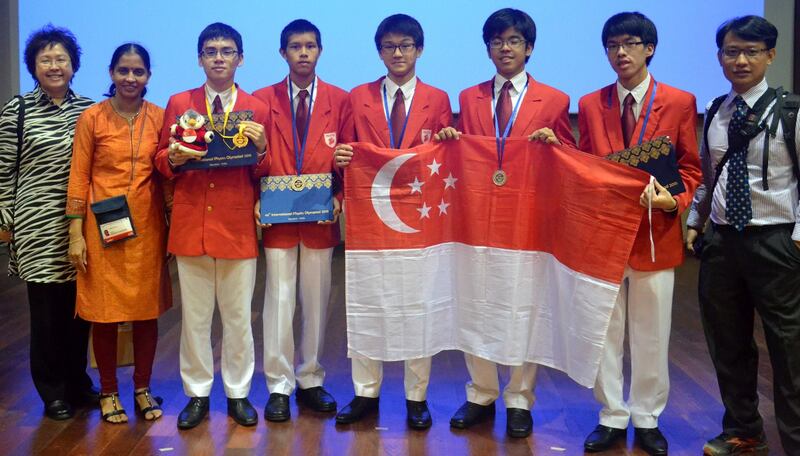 Singapore was placed 3rd in a field of 376 student participants from 81 countries. The Gold medallists are Ding Yue, Kuan Jun Jie Joseph and Huan Yan Qi of Raffles Institution (Junior College) and Ang Yu Jian of NUS High School of Mathematics and Science. The Silver medallist is Wayne Soo Wah Ming from NUS High School of Mathematics and Science. Singapore Team at IPhO 2012. The Singapore delegation was led by Associate Professor Rajdeep Singh Rawat from the National Institute of Education, Nanyang Technological University, Associate Professor Chung Keng Yeow from the National University of Singapore and Mr Chng Chia Yi from Serangoon Junior College. 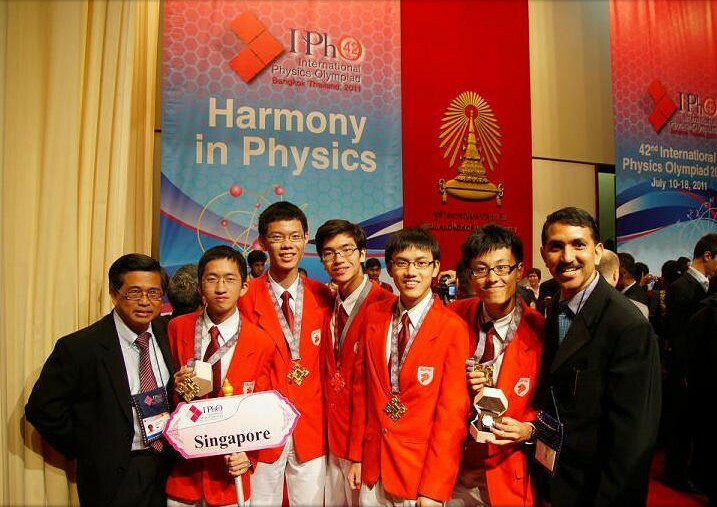 The Singapore team obtained five Gold medals and 1st in ranking in a field of 393 student participants from 84 countries at the 42nd IPhO held in Bangkok, Thailand from 10 to 18 July 2011. Singapore was placed 1st. This is an improvement over our 7th placing in 2010. The other teams that received five Gold medals were from China, Korea and Taiwan. The Singapore Gold medallists are Kang Zi Yang, Li Kewei, Lin Jiahuang and Lin Sen of Raffles Institution; and Tan Zong Xuan of NUS High School of Mathematics and Science. Singapore Team at IPhO 2011. The Singapore delegation was led by Associate Professor Rajdeep Singh Rawat, Natural Sciences and Science Education, National Institute of Education, Nanyang Technological University; and Associate Professor Chung Keng Yeow from the Department of Physics, National University of Singapore.